Then I graduated from 7th-grade: no caps or gowns, but the most serious academic ceremony I’d ever been part of. All the boys had white short-sleeved shirts, black slacks, and a black tie (usually clip-on). All the girls had white dresses. With our families all gathered in the warm gymnasium, the graduating 7th-graders sang them a series of show tunes that we’d been practicing for a month. Then we got diplomas. I was so impressed that I was still wearing my black clip-on an hour after the event was over. A couple months later I was an 8th-grader, a “subfreshman,” at Central High School. Because – I can only assume – I had so stirringly defended Billy Scott and so convincingly denounced English verbs, I was invited to take an elective class in “speech and theatre” normally available only to upper-class students. Two of my classmates were also invited: Jeni (“Alice Adverb”), and Paul (the rather overzealous prosecuting attorney). So while the other 8th-graders were either in “shop” or “home ec” with other subfreshmen, Paul, Jeni, and I were in speech-n-theatre with an even distribution of freshmen, sophomores, juniors, and seniors. Resolved: That governmental financial support for all public and secondary education in the United States should be provided exclusively by the federal government. I learned to recite the topic – to the undying amusement of the other kids on my school bus. We assembled 50 or so 5" x 8" index cards with quotations to use as evidence, and trundled off to our first tournament. Central entered two teams: Doug and Claire were one, and Paul and I the other. It was the first time I'd had a tie on since 7th-grade graduation. This one was also a clip-on, though it wasn't black. It was a metallic bronze paisley. It was just as well. I had enough to worry about without any chance of attracting a girl's interest. We were clueless. We were subfreshmen up against seniors and juniors. We were slaughtered. In the course of that weekend, we debated five times against five different opponents. We were slaughtered, and slaughtered, and slaughtered. Mercifully, we didn't know enough to be embarrassed. And then, one of those rounds, wonder of wonders, we won. I can only credit this to incompetent judging. Meanwhile, Doug and Claire were faring no better. Worse, in fact. While Paul and I eeked out a 1-4 record, Doug and Claire went 0-5. Yes, this was my high school windbreaker. And yes, I still have it. For Paul and me, it was a very strange thing to be small and timid subfreshmen battered and lost in the sea of high school hormones -- and suddenly to also be the top debate team of the whole high school. Paul and I entered our second tournament a couple weeks later as Central's only team and finished it with the 0-5 record we deserved. But judges started to tell us, as they voted against us, "You guys have a lot of potential." Resolved: That the federal government should guarantee a minimum annual income to each family unit. Paul and I got rid of the clip-ons in favor of something more interesting, more challenging, and, astonishingly, even less attractive: over-sized bowties. We learned to tie our bowties right smartly -- a knack I have long since lost. Perhaps the large and garish adornments distracted judges from how bad our arguments were. In any case, Paul and I started routinely going 2-3 at tournaments. We also started getting tired of hearing that we were "going to be good some day." In our little chunk of Georgia, though, Central was now the only school regularly sending a team or two to week-end debate tournaments. So when we showed up for the Regional Debate Tournament, even with three freshmen on our four-person squad (one affirmative team and one negative team), we were the most experienced squad there. We won Region. The Central High principal treated the squad to a steak dinner. Back in school, the freshmen debaters were, on the one hand, still lowly freshmen, but, on the other hand, Region champs at a school that rarely had much success in any interscholastic competition. Still, back on the first hand, we were debaters -- which earned us a small portion of awe and somewhat larger portion of ridicule. In the typology of southern rural/suburban high school in the mid-70s, there were three "pure" types: the jocks, the freaks, and the brains. Then there were the hybrids. Cross a jock and a brain and you got the Student Council Officers. Cross jocks and freaks and you got the soccer team. Cross a freak and a brain and you got a debater. We crashed and burned at the Class AA State tournament that year, but, hey, we were young, and, as the judges said, we "showed potential." 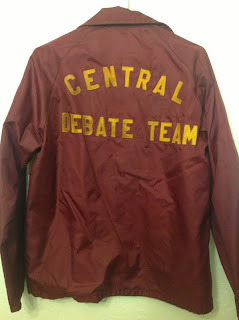 So "debate team" was my niche in high school. It gave me an identity. Something to do with my weekends. Eventually, Paul and I did get pretty good at it: Class AA Georgia State Champions our sophomore and our junior years, and All-Class State Champions our junior year. I didn't have a senior year. During the summer of '76, I went to summer school and graduated Central High School a year early. No cap or gown this time either, since I dodged the ceremony entirely. Next: "Odyssey, part 5: The Commune Attraction"
Previous: "Odyssey, part 3: Mr. Bear's Lover of Leaving"
"Odyssey, part 2: Falling Apples"
Yeah, But What Type of Punk Muslim? Blessed Be. Who Are You?